Plan a trip with the gang to Surf Turf in Kovalam for lessons and fun activities. And if you’ve always dreamed of a beautiful wedding by the beach, Surf Turf can also make it happen! Surfing in Chennai is catching on, and if you’re looking to try it out but don’t know how head to Surf Turf. The surf school offers everything from surf boards and basic surfing gear to rent/buy, along with qualified instructors to teach you how to surf. Situated in a fishing village Covelong Point (30-minute drive down East Coast Road), Surf Turf is a surf school, that offers a bit more than just surfing. The school brands itself as a leisure destination and the services they offer do just that. They’ve got a whole bunch of sea sports. Try your hand at windsurfing, kayaking, catamaran rides, and even fishing, or hang out at their beautiful café, and they even have rooms that operate as a Bed & Breakfast. Plus, they even organise big events like weddings! You can get your dream event or wedding space styled according to your needs — they will handle everything from the invites to guest accommodation and food. Basically the whole deal! I decided to check out Surf Turf, because I wanted to learn how to surf, but didn’t know how. 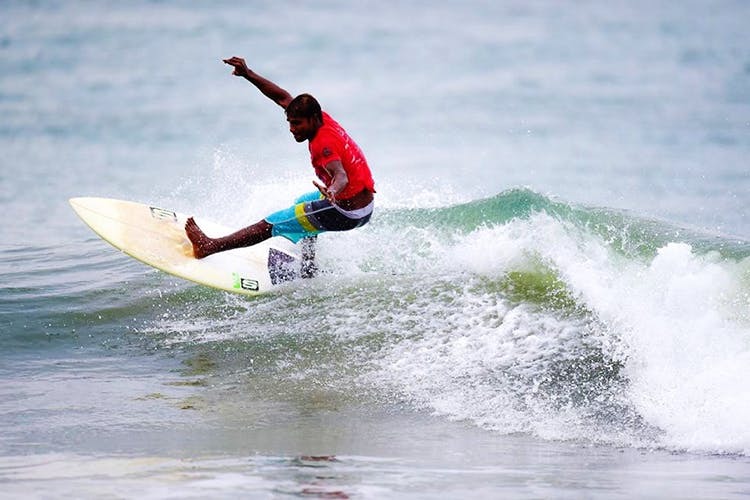 Their surf coaches come from the nearby fishing village, and are super passionate about surfing, so much so that they’re said to be ranked as the best surfers in India! But laurels aside, these guys are rescue & safety certified so don’t fret, you’re in good hands here. The whole experience was thoroughly enjoyable. If surfing doesn’t take your fancy, it’s just amazing to sit at the café to check out how cool the whole place is (my non-surfing friend who was dragged along can attest to this). Try the Meen Kozhambu (if you love Indian seafood preparations) and if you’re feeling more continental try the Aglio E Olio Spaghetti and the Lemon Butterfish at their café. They even have vegetarian and vegan options on offer and can host private parties and dinners. And wait, there’s more. They also have five beautiful ocean-facing rooms with a breathtaking view of the Bay of Bengal, if you’re looking to stay back which you probably will. The prices start at INR 2,500+tax for standard rooms. If you’re looking for lessons as a beginner, prices start at INR 1,500 for two hours (with equipment), though if you’re really keen on getting good, they have a 10-day surf course for INR 13,500. You don’t need prior ocean experience, though it definitely helps to know how to swim.